We are experiencing a heatwave in London. It's pretty strange that the hottest days of the year are at the end of September/beginning of October! Furthermore, London is experiencing temperatures that are higher than Madrid and Rome! And that's official! It was a shame that this was the very time that Fred chose to go to a very cold and rainy Ireland for a long weekend. Anyway, while he was away I used my day off work to go on a mountain bike ride. 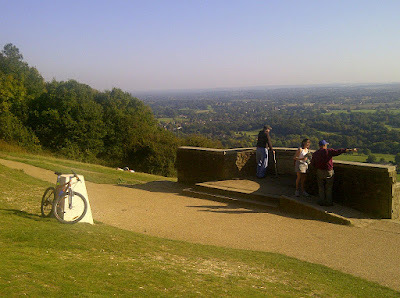 I don't know if riding around the Surrey Hills was the wisest choice considering the scorching temperatures. I even rode up the killer bridleway that climbs up to the summit of Box Hill. No it wasn't easy, and yes I was completely drenched by the time I reached the top. I'm glad I didn't see anyone there who knows me! Once I'd got my breath back I took a couple of photos of the view of Mole Valley and Dorking down below. It doesn't matter how many times I go to the viewpoint at Box Hill. I always love watching the world go by from this high point in Surrey. Many people were out having picnics. It would have been nice to do the same, but I had to push on to bag a couple more hills, albeit easier ones further along, near Reigate. So, there you have it. That was me for 30 days of September. I hope it has conveyed a little bit of what I get up to during a typical month.